This submission only applies to students who’ve been cleared of all failures and have been awarded an overall PASS in their semester’s Pre-Thesis/Thesis achievements. 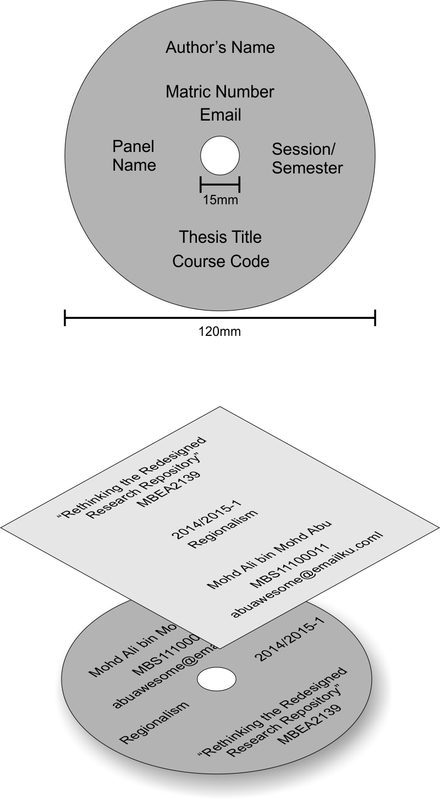 Please refer to the Thesis/Departmental Calendar for the submission deadline. Failure to adhere to the Overall Submission Requirements will result in the suspension of the semester’s grades until all matters have been resolved. Example of CD/DVD/Bluray Submission: Standard width of CD/DVD is 120mm. Cover is a one-sided piece of paper 120mm x 120mm in measurement.